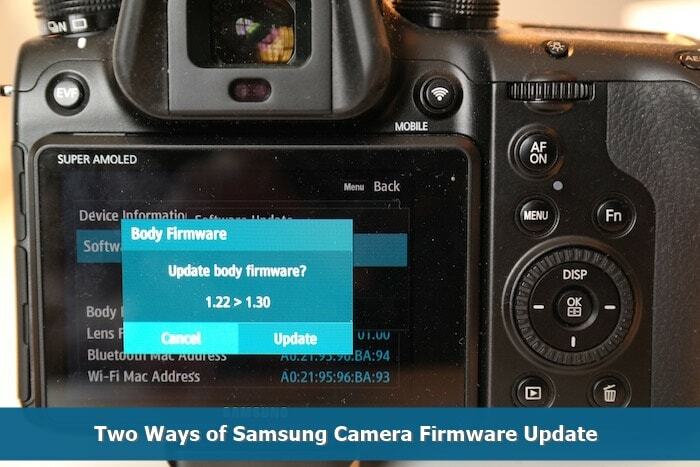 Two Ways of Samsung Camera Firmware Update - Do you have Samsung camera? If yes, this information is probably really good for you. It is about how you can update the Samsung Camera firmware. What is firmware actually Firmware is basically functioned as the operation system in a camera. It means that all the features available inside are managed and controlled by the firmware. While Samsung creates new features and innovations, it enables the users to update it. Commonly, this brand needs around 6 months to do the update. How is it anyway? Here are some ways you can follow. First of all, you must download and install the newest Samsung Kies to your computer. Next, you can connect the camera or Android to your computer. The Kies will automatically detect whether the device has been installed or connected well to your computer or not. Click “Update” without “Backup” option. The firmware will be downloaded to your Smartphone or camera and it can be automatically installed. The process may take a longer time depending on your internet connection. Make sure that you wait for the process until it ends before using it. The use of Samsung Kies is more effective for Smartphone camera of camera that has internet connection in it. But for pure camera without internet connection, it is much better to take out the memory card or disk and then insert it to the computer slot. Next, you can manually download the update file and copy-paste it to your memory card. The installment can be done directly through camera by bringing back the memory card to camera. You can go to firmware menu to do so. Again, the process can be fast or slow depending on the camera itself. So, this is how to do the Samsung Camera Firmware Update. 0 Response to "Two Ways of Samsung Camera Firmware Update"